The inheritance of resistance for bacterial blight, caused by Xanthomonas oryzae pv. oryzae (Xoo), was studied in Minghui 63, an elite restorer line for a number of widely used rice hybrids in China. 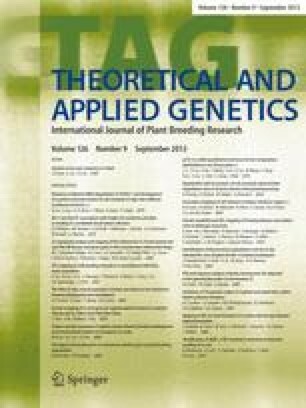 A new dominant gene against a Chinese Xoo strain JL691 in both the seedling and adult stages was identified in Minghui 63 and designated as Xa26(t). Using a total of 477 highly susceptible individuals from an F2 population, the Xa26(t) locus was mapped to a region of about 1.68 cM. This locus co-segregated with marker R1506 and was 0.21 cM from marker RM224 on one side and 1.47 cM from marker Y6855RA on the other side, in rice chromosome 11. A contig map, composed of five non-redundant bacterial artificial chromosome (BAC) clones and spanning approximately 500 kb in length, was constructed. Analysis of recombination events in the Xa26(t) region with the highly susceptible F2 individuals anchored the gene locus to a region covered by three overlapped BAC clones. Assay of the lines showing a double crossover in marker loci flanking Xa26(t), in a population of recombinant inbred lines carrying Xa26(t), further delineated the gene to a 20-kb fragment. The Xa26(t) locus is tightly linked to another bacterial blight resistance gene locus, Xa4. We thank Dr. M.A. Saghai Maroof of the Virginia Polytechnic Institute and State University for providing rice NBS clone and the International Rice Research Institute for the near-isogenic lines of bacterial blight resistance and the Philippine strains of Xoo. This study was supported in part by a grant from the National Natural Science Foundation of China and a grant from the National Key Program on Basic Research and Development of China (973).